PFC Corey Johnson was killed in action May 27, 2011 in Diwar, Kandahar province, Afghanistan, when insurgents attacked his unit with small arms fire. Corey was an experienced hunter and tracker who grew up fishing and hunting in Arizona’s high country. At 16, he dropped out of high school to work with his father operating heavy mining equipment. Then at 18, he moved to Colorado to work in the oil fields. At 25, he returned to Arizona, and after enlisting help from Senator John McCain, he joined the Army in February of 2010. 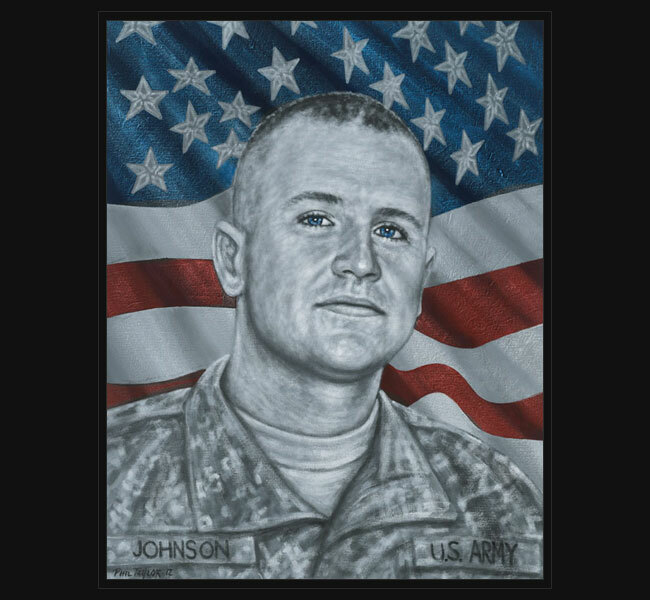 After completing training in Fort Jackson, South Carolina, and Fort Drum, New York, Johnson was deployed to Afghanistan in March 2011. According to his family, Corey had wanted to make a better life for himself. He had recently gotten married and had a daughter on the way. Original portrait was presented September 8, 2012 to his mother and family at a special ceremony held during the Patriot Days events at the Hyatt Gainey Ranch Resort in Scottsdale, Arizona.